As this recipe is for a 'Leftover' stir-fry, please use whatever you have in your own kitchen and take this simply as a guideline to achieving a frenzy of Chinese flavours with whatever you have to hand! So go on, get creative and get cooking! Place 2 nests of dried egg noodles in a bowl and cover with hot water. Set aside and leave to soak for approximately 3-5 minutes, until you see them lose that packet-shape and start to spread out. Meanwhile, make your sauce! In a clean bowl add your vegetarian stir-fry sauce, chilli oil (for spice), light soy sauce (for saltiness), dark soy sauce (for sweetness) and a dash of sesame oil (for that classic Chinese noodle flavour). Mix together well and set aside. (Hint: the key to a successful stir-fry sauce is balancing flavours. Adapt what we have suggested to the sauces you have in your cupboard, bearing in mind the combination of salt, sweet and spice when deciding quantities. Give it a taste if you're unsure!). Once your noodles are adequately soaked, separate them with a pair of chopsticks before draining them in a sieve. Next, grab a plate and cover it in a clean tea towel. Spread the noodles over the towel and leave to dry for 10-15 minutes, turning once midway; or, if you need to speed things up, set your oven to fan setting at 30 degrees and leave your noodle plate in there for between 3-5 minutes. Get chopping! Remove the dry, dark green leaves from your spring onions and then roughly chop 3 of them into large pieces. Finely slice the remaining spring onion into matchsticks. Slice your hard vegetables (in our case, the brocolli and pepper) into 2-inch long strips, before finely chopping your garlic and ginger. Pick your medley of mushrooms and place in a bowl; if using Shiitake mushrooms, separate them from the bowl and chop them into fine slices. 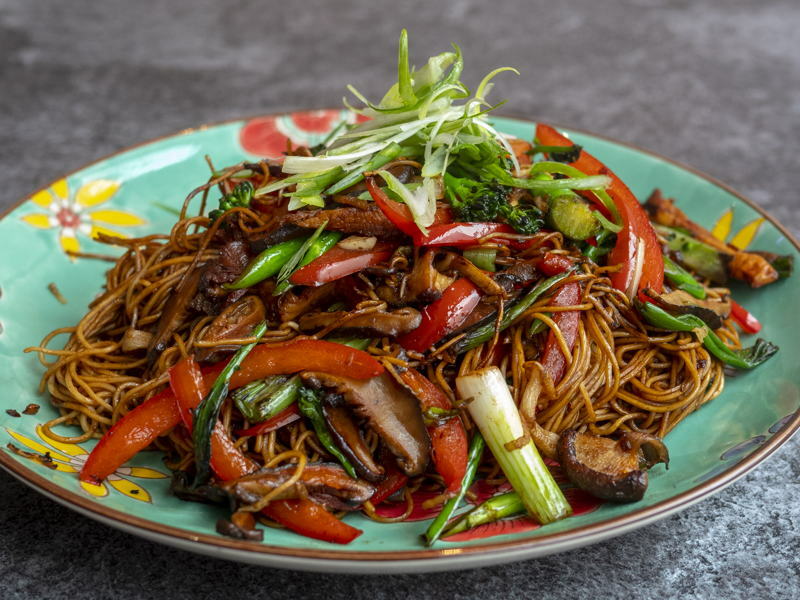 Time to build your wok clock: Place your bowl of mushrooms at 12 o'clock, and then arrange the roughly chopped spring onion, the ginger, garlic, broccoli, pepper, sliced shiitake, and spring onion matchsticks clockwise around your plate. Pour an inch of vegetable oil into the bottom of your wok, heating over a high heat until it is smoking-hot. Add your bowl of mushrooms to the wok, gently stirring and folding them into the oil to flash fry them for approximately 1 minute (Hint: you will know when they are done when the sound of sizzling decreases). Drain the mushrooms using a sieve and set aside in a bowl. Next, add your flash fried mushrooms along with the shiitake mushrooms and vigorously stir-fry for 1 minute. Now push this vegetable mixture to the side of your wok, placing your noodles in the newly-created space before stir-frying everything together to ensure the noodles are evenly distributed throughout. Finally, over a high heat, drizzle half of your sauce into the wok and stir fry for 2 minutes. At this point, taste the dish and add more sauce as required. When the noodles begin to stick to the bottom of the wok, you know you're done! Serve on a plate, garnished with the remaining matchsticks of spring onion. Tuck in!